May 08 - The month got off to an excellent start because we went on holiday. The rest of the month was less exciting and the weather for the latter part of the month was really miserable. We still haven't flown the balloon this year although we have had it tested for its Certificate of Airworthiness so it is now ready to be flown once the weather starts to improve. 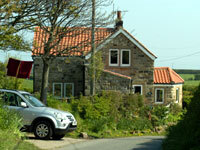 The picture of Holly Cottage, Boggle Hole doesn't really do justice to the setting. the cottage was towards the end of a single track lane with views across farmland and down to the sea cradled by Robin Hood's Bay. At one end of the bay is the village of Robin Hood's Bay - the fact that it's the name of the bay and the village is a little confusing but we learned to cope. 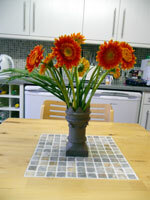 Jane managed to get one of the wall tile squares placed into the kitchen table and it is really impressive. This is one of the last pieces in fitting out the kitchen. The flowers were a present from some of Jane's squash colleagues - Maria and Ruth after Jane had scored their squash final game at the Cripps centre. Jane mentioned that it was a particularly difficult game to score because of the fast, close play. Because she was so involved in the scoring she didn't really get a chance to enjoy the game. 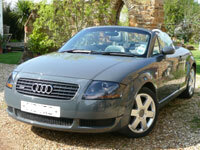 After advertising the car for the last week of April and another 3 weeks into May it is still sitting in the garage waiting for a buyer. At the end of the month we decided to part exchange it but you will have to wait until next month to see what will replace it.